The camera presented on this page is an 11 x 14-inch American-tailboard wetplate field model with a healthy dose of collodion staining. The large 17" x 17" front and rear standards mounted on 25-inch folding rails must have made this a formidable camera in the field. Construction details point to a "box" (as cameras were sometimes called during this time) dating to the late 1850s to early 1860s. Identifying early, unmarked cameras is always an adventure. Makers often borrowed ideas from each other, resulting in many cameras looking alike. It also makes life difficult for collectors (such as myself) who "need to know" about the lore and legacy of early equipment. Although unmarked, the unconventional side-loading plateholder design has a strong resemblance to a rare 12 x 12 inch Lewis wetplate camera (c.1862). However, several subtle design differences made me question if it was a Lewis camera. Discussions with early equipment experts Pete Schultz and Matthew Isenberg concluded that the camera was not a Lewis. Clues to unmarked cameras are found in small details. For example, the camera body is assembled with hand-cut dovetails instead of finger joints. While finger joint construction is typical for Lewis and many other wetplate (post daguerreian) cameras, dovetails on American cameras made during this time is unusual. Late 1850s - Early 1860s. Shown with plateholder mounted. Thanks to Rob McElroy (collector and contemporary daguerreian photographer), we now have bits of information about Ebenezer Gordon. Digging deep into his resources, as well as some handy sleuthing on the Internet, Rob found a descendent (cousin) of Gordon who has papers with information about Ebenezer from her grandmother. Another non-traditional construction detail is how the large lensboard mounts onto (actually "into") the front standard without using metal hardware. To accomplish this, the wood panel slides into slots located inside the camera body. Once mounted, it has the appearance of a shadow box. But the most interesting characteristic is the overall lack of hardware. In fact, the only metal found on the camera is a brass strip on the center rail, an unusual cast brass focusing lock, and hinges to fold the bed-rails. That's it! A clue to the camera's origin was found inside its collodion wetplate holder. Four metal corners mounted inside the holder are marked: E. Gordon patent, October 19, 1858. This corresponds to U.S. patent #21,829 for a Photographic Plate Holder awarded to Ebenezer Gordon of New York. Ebenzer's invention was a simple metal corner mounted inside a plateholder that allowed a photographic plate to be reversed inside the frame. According to the patent notice, the camera did not have to be turned on its side "to the inconvenience of the operator." This style of plate holder also appears to be the earliest example of its kind. An 1860s announcement (left) mentions that the patent was extended for seven additional years. The announcement also notes that the American Optical Company purchased the patent and that their cameras (including apparatus made under the Scovill name) would continue to use the patent corner. Did Gordon also build the camera? 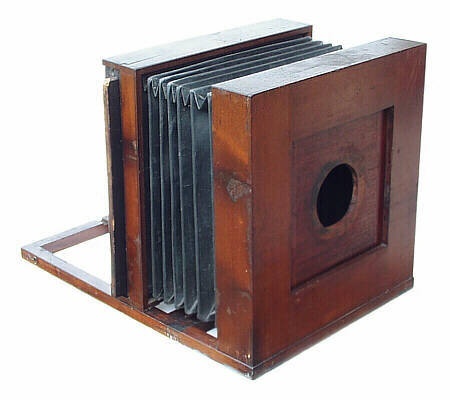 After examining the camera's overall design, in particular the manner in which the back and plateholder fit together, I believe it can be attributed to Gordon; or that Gordon collaborated with a builder (or company) to create a camera to his specifications. For example, the rectangular (11 x 14-inch) ground glass is mounted in a square wood frame, which has the same plateholder dimensions. Since the ground glass can be reversed for landscape or portrait views to match the orientation of the photographic plate, this would imply that the plateholder and ground glass assembly had to be designed along with the camera body. We now know that Ebenezer was born in 1817 and died about 1890. Based on information obtained from his cousin, he entered into the photographic trade during its early years and was listed in New York directories as a plate maker (1847-1848), daguerreian frame maker (1851-1852), daguerreian supplier (1860) and photo materials salesperson (1869). Experience as a plate and frame maker probably gave Gordon a specialized insight into photographer's needs that led him to invent and patent an improved plate holder. As an interesting side note, Gordon married Catherine Tompkins (of Henrietta, NY - a suburb of Rochester) on September 10, 1846 in Rochester - about a year prior to the earliest listing of Gordon's involvement in photography. Tompkins was also the last name of a daguerreotypist living in Buffalo, NY by the name of Joseph H. Tompkins. Could the photographer be related to Catherine? If so, Tompkins may have been the inspiration for Gordon to become involved in photography. 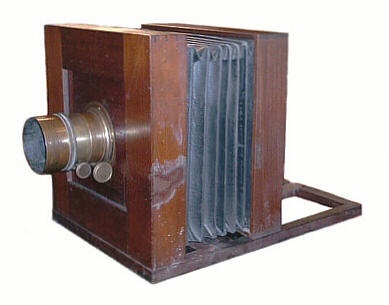 Gordon camera with an 1850s Cone Centralisateur brass lens.